Does Your Excavator Only Have a Single Flow Hammer Circuit? Need an Easy & Cost Effective Way to Reverse Your Attachment? Flow Reversal Valves, for easy two way (Bi-Directional) use of your auger drive or other attachments. Utilising the single way flow from your hammer circuit, forward and reverse control is obtained via an electrical signal either 12 or 24 volt (different models). 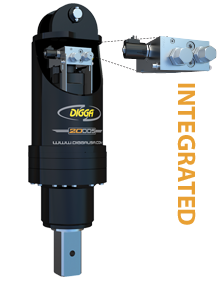 The Digga Flow reversal system has been rated to ensure a low pressure drop for the specific valve and drive unit (meaning more power to your drive head). Electrical wiring kits (purchased separately) utilise high quality weather-proof Deutsch connectors for maximum performance and safety on the job site. For operators with excavators fitted with only a hammer circuit, that want a cost-effective solution for bi-directional flow for their attachments. Mounted in the operator's preferred position directly to the host machine. 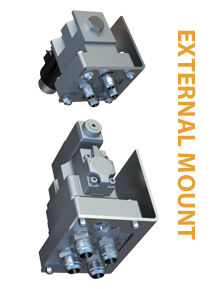 Externally mounted 2 Way Valves take the one way flow from your hammer circuit & then utilising an electrical switch (runs back to the cab), allows for forward & reverse control of the drive unit.